Champion sire Furyofthewind died last week from from complications of colic. 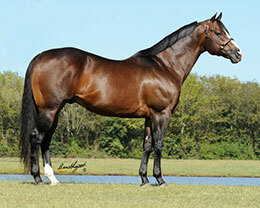 BREAUX BRIDGE, LA—FEBRUARY 4, 2019—Copper Springs Ranch's champion sire Furyofthewind SI 96 died last week at the age of 16 from complications from colic. The son of leading sire Corona Cartel stood at Robicheaux Ranch Inc. near Breaux Bridge, Louisiana. "It has been a rough two weeks here at Robicheaux Ranch! To losing one stallion but now two. In 19 years since Robicheaux Ranch opened, I have had to bury only two stallions, and now unfortunately we’ve had to bury another two. 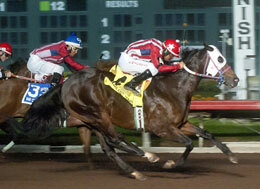 With Fury it was just an unexpected bad luck to colic," Ryan Robicheaux said. "We want to thank Copper Spring Ranch for letting us be part of his life the last four years. And to Phillip Stewart, Bob Moore Farms and previous owner Kirk Goodfellow on starting his stallion career. He was a unique stallion full of personality, and we will miss him!" Copper Spring Ranch said the $220,000 Louisiana racing incentive for two-year-old sired by Furyofthewind, announced earlier this year, will remain in place and will include any Furyofthewind two-year-old's racing in 2022 (see related story). Bred and raced by Kirk M. Goodfellow, Furyofthewind won the California Derby Challenge(G3) and was a finalist in the Golden State Derby(G1), AQHA Derby Challenge Championship(G1), El Primero Del Ano Derby(G1), California Juvenile Challenge(G3), Rheudasil Handicap and Whosleavingwho Handicap. He won or placed in nine races an earned $70,554. 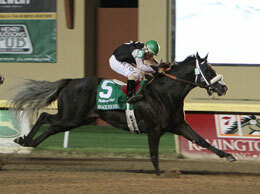 2013's AQHA Racing's Champion 3-Year-Old Colt. From 10 crops to reach racing age he sired 175 winners, 37 black type (12%), 1 champion, earnings of more than $6.7 million with average earnings per starter of $22,100. His top performers include AQHA Racing Champion Three-Year-Old Colt Brace For Bernal SI 105 (9 wins to 3, $322,326 Heritage Place Derby-G2, etc. ), Golden State Futurity(G1) winner Turbulent Times SI 94 (5 wins to 3, $564,146), New Mexico Classic Derby(RG2) winner Quatro Menudos SI 104 (6 wins to 4, $300,386), New Mexico HBPA Stakes(RG2) winner Fury Of The Storm SI 93 (6 wins to 3, $292,291 New Mexico Hi-Point Three-Year-Old Gelding, etc. ), TQHA Sale Futurity(RG2) winner Just Another Natural SI 103 (3 wins at 2, $217,957) RG2-placed Reckless Wind SI 95 (7 wins to 9, $181,594), AQHA Challenge Championship(G1) runner-up River Wind SI 104 (4 wins to 7, $171,373), FQHRA Stallion Stakes Futurity winner Anna Delovely SI 98 (2 wins to 4, $108,407), Black Gold 350 Championship Futurity runner-up Charlies Fury SI 101 (2 wins at 2, $101,966), etc. By leading living sire Corona Cartel, Furyofthewind is out of the two-time AQHA Racing Champion Filly Dashing Phoebe SI 104 ($609,553), a four-time grade 1 winner. She is the dam of 16 ROM, 15 winners, 2 champions, 6 black-type including four-time champion All American Futurity(G1) winner Heartswideopen SI 103 ($1,885,283), champion aged mare Special Phoebe SI 103 ($139,963), Grade 3 winner Furyofthewind SI 96 (see above), RG3 winner and G1 finalist Dashingfordestiny SI 97 ($56,961), RG3 winner Solid Demand SI 102 ($35,285) and RG3-placed Especially Phoebe SI 92 ($24,842), etc. Dashing Phoebe is the granddam or great-granddam of AQHA Racing World Champion Bodacious Eagle SI 103 ($989,286), AQHA Racing Champion and champion sire American Runaway SI 105 ($686,355), AQHA Racing Champion Hes Relentless SI 108 ($616,380), Grade 1 Los Alamitos Million Futurity winner Worth Doing SI 93 ($1,128,696 at 2), Grade 3 winner Tempting Destiny SI 95 ($302,699), multiple Grade 2 winner FM Im A Zatanaz Too SI 96 (6 wins in 10 starts at 2, 2018, $300,530), stakes winner and track record holder Corona Ease SI 129 ($209,820), to name only a few. The second dam is the stakes winning Lady Bug's Moon mare Phoebe's Moon Bug SI 91, dam of 9 ROM, 7 winners, 3 black type. This is the family of AQHA racing champion Walk Thru Crystal SI 95 ($675,855), Heritage Place Futurity(G1) winner Phoebes Otoole SI 103 ($370,976), RG2 winner Zoobilee SI 112 ($249,267), Brace Your Glass SI 99 ($151,476), etc. Furtyofthewind was buried at Robicheaux Ranch.